Anse Patates is a very tiny, yet really beautiful beach right at the Patatran and L´Ocean hotels. It´s safe to say that it´s the smallest beach after Anse Songe on the west coast. 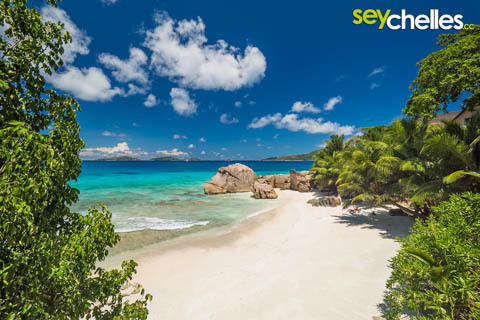 Considering that and also the proximity of the two hotels, it is quite crowdy compared to other La Digue beaches. Anse Patates is said to be good for snorkelling. We´ve been there, but as always it depends on what you´ve seen before. If you have never been snorkelling on a really great reef you´ll sure be happy, otherwise not so much. However, it is definitely one of the best beaches for swimming, once you went over the shallow area and there is also quite some shade of trees.